Graduation parties are a cinch to plan. First, plan ahead to ensure your rental choices will be available and to make sure your guests have marked their calendars. Next, determine your budget for rental equipment, food, decorations, invitations, and incidentals. Then comes the fun stuff… choose your theme and color scheme. Most parents choose to go with the school colors of the school their child graduated from or of where they are headed. But, if you want to stand out from the crowd, we happen to be partial to the Anthropolgie inspired “Keys to Success” theme (pictured above and soon to be blogged). 1) Tables for guest seating (nobody wants to stand and eat). You can rent round or rectangular tables, it’s purely your preference (I happen to prefer round tables). 2) Tables for food, dessert, drinks, and any displays/picture collages of the graduate. Rectangular tables tend to work better for the latter. 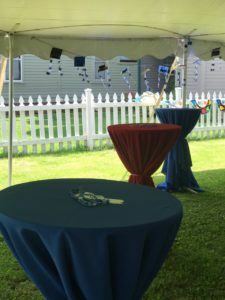 3) Let’s talk tents… tents are popular for graduation parties because they offer shade for sunny summer days. We typically recommend a 20 x 20 or a 20 x 30 frame tent. The 20 x 20 frame tent holds up to 40 people and a 20 x 30 frame tent can accommodate up to 60 people. 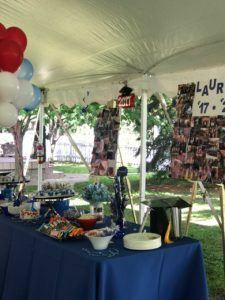 People are happy with a 20 x 20 tent because most graduation parties are set up to be open houses where people linger in and out frequently. Under the 20 x 20, you can use all four tables for guest seating and keep the food and drinks inside, where it’s cool. 4) Linens will make your look complete! You can rent halfway drop linens if you don’t want a formal look and they are less expensive. As far as fabric, polyester is the most popular and affordable. Other fabrics may be too dressy or formal. 5) Send out invitations at least eight weeks in advance. 6) Meet and choose a caterer. If you are DIY queen and want to prepare the food yourself, make sure to plan ahead. You can rent bowls, trays, and utensils, or anything else you may need for the buffet. 7) If you have any other professional needs, such as florists, bakers, event planners, contact them in advance to discuss your needs. 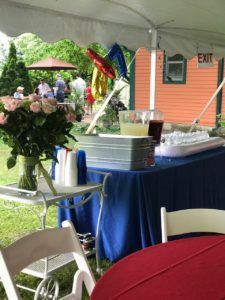 Thanks for sharing this graduation party organizing tips.it is perfect for My graduation party. i like your blog. great post!